You will probably get this error when you are trying to use one edmx object from another project, and normally happens with a WCF service or a WinForm Application. This is the scenario; we have one project where we have the data model (AxxiaDALSP) . 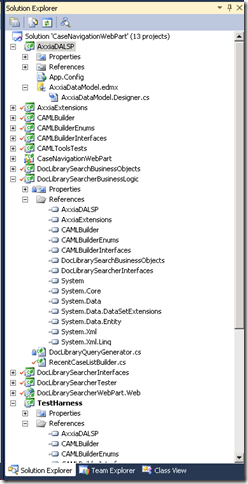 In order to make that work we will call that dll (project) from our test harness (TestHarness) project. We are working with .NET 3.5 because we are developing something for Sharepoint and when we call our object we get: “The specified named connection is either not found in the configuration, not intended to be used with the EntityClient Provider, not valid.”.